The Android v4.3 update for the 2013 Samsung flagship was rolled out in India towards the end of the last year. Now the company has started pushing the latest Android v4.4 update for the Samsung Galaxy S4 users in the country. 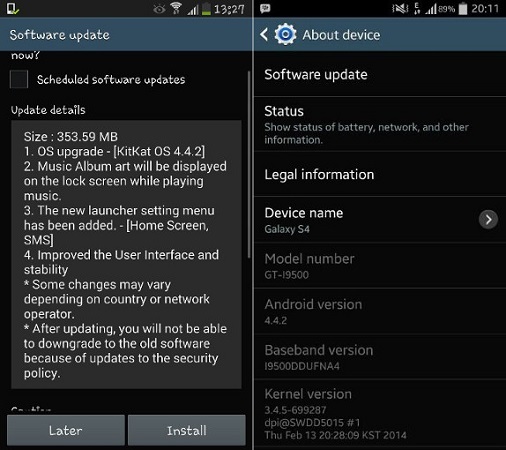 The Android v4.4 KitKat update for the Samsung Galaxy S4 has started rolling out in India. The update, which is available Over-the-Air (OTA), weighs a heavy 353.59 MB and is recommended to be downloaded on a high speed Wi-Fi connection. The update can also be obtained by hooking the device with the Samsung Kies software. The Android v4.4 KitKat update for the Samsung Galaxy S4 brings minor tweaks in the UI besides adding wireless printing and emojis support. The update also brings new launcher settings and the improved Samsung Keyboard. The lock screen camera shortcut with full screen music album art is added. So if you are a Galaxy S4 owner hit the settings menu and check if your device has received the update.